In a recent review, the percentage of football-related deaths among total sports-related deaths differed considerably between various European countries and the USA, ranging from 4% to 100% (2/51 to 15/15 cases) football-related deaths.14 Furthermore, a retrospective survey covering the period from 2002 to 2012 reported 107 cases of SCD/SCA and 5 unexplained football-related sudden deaths in 126 of the 170 surveys returned from 209 FIFA member associations. In their article, the authors concluded that national registries which accurately measure SCD/SCA in football are rare and greatly needed.4 Therefore, in 2014 the Federation FIFA launched a Sudden Death Registry (FIFA-SDR) to document and examine fatal events in football worldwide. FIFA-SDR is built on an internet-based data platform, media-screening and national registries. 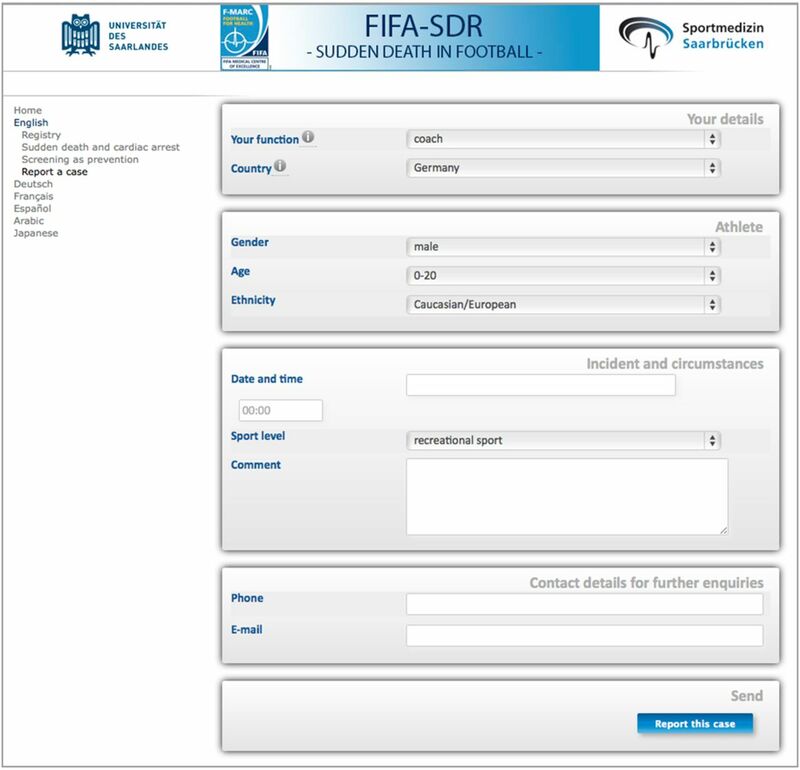 The confidential internet-based data platform (http://www.sudden-death-in-football.com; figure 1) is under the auspices of FIFA and conducted by the Institute for Sports and Preventive Medicine in Saarbrücken, Germany, with a template to report cases from all over the world. The database records cases of sudden deaths as well as successfully resuscitated sudden deaths of football players occurring during or up to 1 h after football training or competition. FIFA-SDR database became operative in January 2014, starting with the four corresponding languages of FIFA (English, French, Spanish and German). Doctors, relatives, athletes, coaches and other persons involved can report cases via a confidential online access leading to a questionnaire regarding the circumstances of a sudden death or successfully resuscitated sudden death of a football player (figure 2). The personal data of deceased athletes, such as names or addresses, are not recorded. 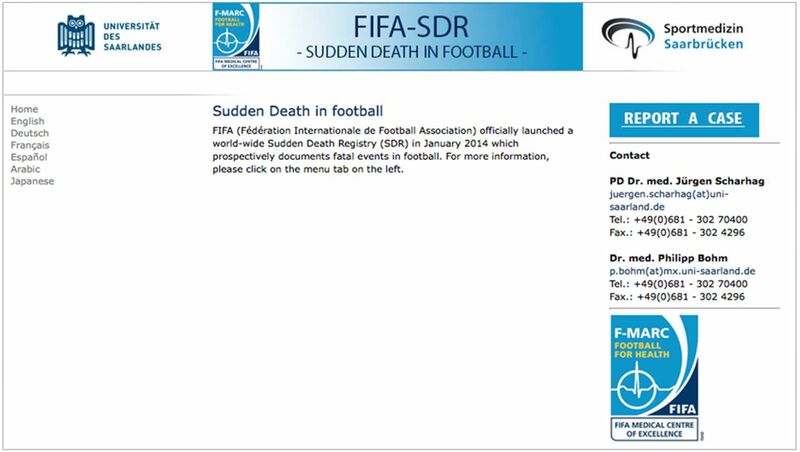 Starting internet-page of the FIFA Sudden Death Registry (FIFA-SDR) at http://www.sudden-death-in-football.com. By clicking the field ‘REPORT A CASE’ persons can report cases on a sudden death or successfully resuscitated sudden death of a football player via a confidential online access leading to the questionnaire. FIFA Sudden Death Registry (FIFA-SDR) case report questionnaire on the internet. Any involved person (eg, doctors, athletes, coaches, relatives, as well as others) can report a sudden death or successfully resuscitated sudden death of a football player and provide information on the circumstances. The personal data of deceased athletes, such as names or addresses, are not recorded. By clicking the boxes, ‘Your function’ and the ‘Country’ can be chosen. Furthermore, the gender, age category and ethnicity of the deceased athlete can be given. Further information on the incident and circumstances can be reported in ‘Date and time’, the ‘Sporting level’ (‘recreational sport’, ‘competitive sport (no elite)’ or ‘competitive sport (elite)’) and a field that allows further comments. Finally, the contact details for further enquiries should be given. By clicking ‘Report the case’, the information is sent to the Institute for Sports and Preventive Medicine, Germany, confidentially. In addition to the internet-based platform, existing national registries have been and will be contacted. Furthermore, a sample of countries will be chosen to representatively assess incidence and disease distribution in all continents, including monitoring of regional and nationwide media, wherever possible. After initiation of the FIFA-SDR, the project was demonstrated to the public at the Team Physician Workshop for the FIFA World Cup 2014 (Florianopolis, Brazil). Furthermore, FIFA Medical Centres of Excellence were informed during a FIFA ad hoc session at the Isokinetic Conference 2014 (Milano, Italy). In addition, FIFA-SDR was presented to the members of the Working Group on Sports Cardiology of the European Society of Cardiology at the conference of the European Association for Cardiovascular Prevention and Rehabilitation (EACPR) in 2014 (Amsterdam, the Netherlands). Via email correspondence, the project was introduced to all 209 FIFA member associations and a short questionnaire was added to analyse the football-associated medical structures in the countries of the FIFA member associations. The questionnaire sent to all FIFA member associations consisted of the following questions: (1) Does your national football association have a medical committee? (2) Does a national registry for incidents of sudden death, whether in sport in general, football or otherwise, exist in your country? (3) Is anyone in your country or at your national football association responsible for scouring the media for incidents of sudden death in sport in general or in football? (4) Is a cardiovascular PCMA performed for your football players before the start of the season? So far, 38 FIFA member associations replied. Of those, 30 (79%) reported having a medical commission, 13 (34%) reported having a national registry for sudden deaths and 14 (37%) stated having media screening. A PCMA was reported to be performed in 35 (92%) FIFA member associations. By now, 23 cases of sudden deaths in football players have been registered. The mean age of the 22 male players and 1 female player was 27±11 years. Twenty players died because of a SCD, while three suffered from a lethal traumatic injury. Fifteen deaths happened during the match, two during the warm-up, one after the match and five during training. Four sudden cardiac arrests could be resuscitated (2 myocardial infarctions, 1 coronary anomaly, 1 unknown underlying disease). Compared with the German Sudden Cardiac Death Registry (SCD-Deutschland; http://www.scd-deutschland.de) the international cases of sudden deaths during football were younger (22±5 vs 35±15 years). For the first time, FIFA-SDR offers the opportunity to examine SCD and SCA in football players and therefore, to improve our knowledge and understanding of sudden deaths in apparently healthy athletes. Thereby, this data will help to detect possible regional or national differences, and to improve preventive measures which may be adapted to specific regional or national circumstances and conditions to further help prevent SCD/SCA in athletes. Persons or associations who are interested in the FIFA-SDR and would like to cooperate are warmly welcome to contact FIFA-SDR by sportscardiology@uni-saarland.de.
. Sports related sudden death in Germany: preliminary data from a nation-wide registry. Euro Prevent 2014:P714.
. Sudden death in sports among young adults in Norway. Eur J Cardiovasc Prev Rehab 2010;17: 337–41. Ethics approval Ethics Committee of Saarland, Germany.